Electrocutions caused by a crane, load, or load line contacting a power line have caused numerous fatalities. To prevent such accidents in the future, the standard contains detailed, systematic procedures that employers must follow when operating cranes near power lines. These procedures are designed to (1) prevent equipment from making electrical contact with power lines; and (2) protect workers in the event that such contact occurs. NOTE: Special rules apply to work covered by 29 CFR, Subpart V, Power Transmission and Distribution. This information does not cover Subpart V work. The First Step – Could the Crane Get Closer Than 20 Feet to a Power Line? Keeping a safe distance from power lines is the key to preventing power line accidents. Therefore, the first step you must take when planning to operate a crane on a site where a power line is present is to identify the crane’s work zone and use that work zone to determine how close it could come to the power line. If you determine that no part of the crane, load, or load line could get closer than 20 feet to a power line, no further precautions are required. If the initial plan for the crane’s use changes during the project, you must reevaluate whether the equipment could get closer than 20 feet to the power line. Note: If the line’s voltage is over 350,000 volts, a 50-foot, rather than 20-foot, minimum clearance must be maintained. This assumes that the voltage is less than 350,000 volts and uses the 20-foot clearance distance. There are two ways to identify the work zone and use it to determine whether the equipment could get closer than 20 feet to the power line. First, if the equipment (crane, load, load line, or rigging) could not get closer than 20 feet to the line even if the crane is operated at its maximum working radius, the 20- foot requirement is satisfied. Alternatively, you may establish a work zone by establishing boundaries (using flags or a device such as a range limit device or range control warning device) that are more than 20 feet from the power line and prohibiting the operator from operating the equipment past those boundaries. 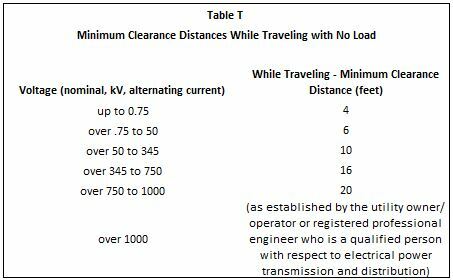 One way to determine the line’s voltage is to ask the line’s owner or operator. The utility must respond to such a voltage inquiry within two working days. If you determine that part of the crane, load, or load line could come closer to the power line than the required minimum clearance distance (either 20 feet or the Table A clearance), you must either de-energize and ground the line or take specified steps to maintain the required minimum clearance distance. These options will now be discussed. De-energizing and visibly grounding the line will protect against electrocution and avoid the need for additional precautions. However, the employer must rely on the power line’s owner or operator to take these steps, and utilities are generally unwilling to de-energize their lines because doing so will cut off service to their customers. As a result, this precaution will usually not be available. You must assume that all power lines are energized unless the utility owner/operator confirms that the power line has been and continues to be de-energized and the line is visibly grounded at the work site. You must take all of the following steps. The precautions described above for crane operations must also be taken when assembling or disassembling a crane near a power line. Under no circumstances may a crane be assembled or disassembled beneath an energized power line. A crane traveling with a load must comply with the minimum clearance distance and associated precautions listed above. 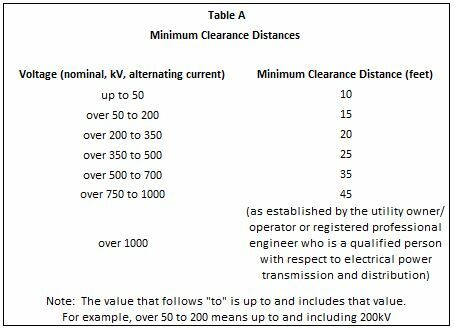 If the crane is traveling with no load, the following clearance distances must be maintained. In determining whether the equipment will maintain the required clearance distance, you must take into account the effects of speed and terrain on the equipment’s movement (including movement of the boom/mast). In addition, if any part of the equipment can get closer than 20 feet to the line, you must use a dedicated spotter to observe the clearance and signal the operator in order to keep the required minimum clearance. You must have the power line owner/operator or a registered professional engineer who is a qualified person with respect to electrical power transmission and distribution determine the minimum clearance distance that must be maintained to prevent electrical contact in light of the on-site conditions. The factors that must be considered in making this determination include, but are not limited to: conditions affecting atmospheric conductivity; time necessary to bring the equipment, load line, and load (including rigging and lifting accessories) to a complete stop; wind conditions; degree of sway in the power line; lighting conditions; and other conditions affecting the ability to prevent electrical contact. You must hold a planning meeting with the utility owner/ operator (or registered professional engineer who is a qualified person with respect to electrical power transmission and distribution) to determine the procedures that will be followed to prevent electrical contact and electrocution. You, along with the utility owner/operator (or registered professional engineer) and all other employers involved in the work, must identify one person who will direct the implementation of the procedures. That person must have the authority to stop work at any time to ensure safety. The danger of operating a crane close to a power line cannot be overemphasized. Procedures that may appear adequate at the beginning of a job may not be adequate in practice. For example, if electricity arcs from the line to the equipment, whatever precautions are being taken are not sufficient. Therefore, if there is any indication that the procedures being followed are inadequate to protect workers, you must safely stop operations and either develop new, more protective procedures or have the utility owner/operator de-energize and visibly ground or relocate the power line before resuming work.